One version of the first Preakness date. Photo by The Racing Biz. If you go by the June 3, 1908 Daily Racing Form, the first Preakness was in 1894, when Assignee won it. Fourteen years later, the DRF revised its account, printing that the Preakness was first run in 1909. 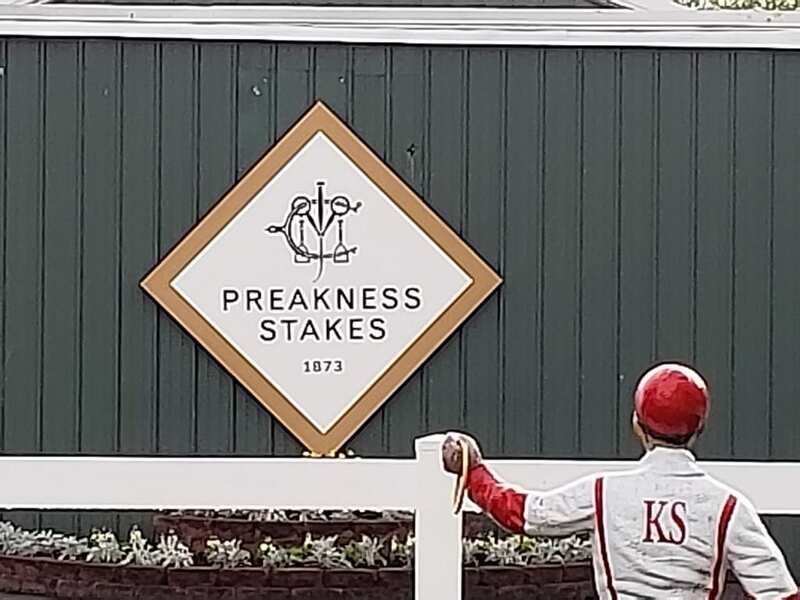 And there are some observers, like racing historian and Mid-Atlantic dweller Kevin Martin, who might argue that this year is actually Preakness 127. Don’t go checking the websites for Pimlico or the Preakness for verification; both relate the history of the racetrack and to some degree the history of the race, but both also rather cagily avoid declaring the year of the race’s inception, and neither has a list of the race’s winners. So just what is the dealio with the Preakness? The winner that first year? A horse named Preakness. His owner? Milton Sanford, aka Preakness Stables. Know who finished last that year? A filly named My Maryland. Three years later, a race named for Preakness debuted at Pimlico, and the rest, they say, is history. Sure. Easy for them to say. In 1889, the Baltimore Sun, in an article with a sub-headline that read, “Abuse of a Noble Sports by Tracks Adjacent to Other Large Cities…The Past Glories of Pimlico,” reported that Governor Bowie, who was also the president of the Maryland Jockey Club, had written to members of the club to inform them that the Maryland Agricultural Society had taken possession of Pimlico following the expiration of its lease, and that the MJC would no longer hold race meetings there. But why? Bowie’s reason might sound familiar: competition from other racetracks that made it difficult to attract horses to Pimlico. Since Pimlico had opened, a number of other tracks—Monmouth, Brighton Beach, Gravesend, Sheepshead Bay — had also been established. The number of days the New York tracks could run was limited by state law, but two tracks in New Jersey, Clifton and Guttenberg, were under no such restrictions. That same year, Morris Park opened in what is now the Bronx. Called by the New York Times “the finest racetrack in the world,” in 1890 it offered for the first time a race called the Preakness Stakes. Neither the Sun, nor the Times, nor the DRF makes any mention of the Pimlico race being transferred north. The Preakness simply disappeared from Maryland and appeared a year later in New York City—open to horses three years old and up. The winner that first year? A five-year-old called Montague. His owners? None other than Mr. Sanford’s Preakness Stables. Over the next three years, there is no record of a Preakness having been run at any track in any state. When the Preakness returned in 1894, it was run not at Pimlico, not at Morris Park…but out in Brooklyn, at the old Gravesend track, and it was at Gravesend that the erstwhile peripatetic race found a home for the next 14 years. No less a turf writing luminary than Joe Palmer asked of the Gravesend Preakness, “Was it the same race, or were there two Preaknesses, or, as our Mr. Smith puts it with his Latin flair, Preaknii?” Kent Hollingsworth, too, interrogated the history of the race, at the same time offering a critique of a now-beloved Preakness tradition, tempering his acerbic observation with a pronouncement over the wisdom of which there can, unlike the history of the Preakness, be no dispute. “…the traditional wreath of daisies painted like Black-Eyed Susans will be placed on the 92nd winner of the Preakness in front of a small replica of the Old Members’ Clubhouse cupola which burned last year. “These sorts of traditions are made, not born. They are unnecessary embellishment of one of America’s great races.